They're handing out mini Bibles instead of candy, in an effort to get kids to think that reading it is a "treat." http://newsfeed.time.com/2011/10/10/the-...politics-huffpo Hmmm...maybe some kids will come up with inventive and creative "tricks" to counteract the false "treat" they were given? Yes, a xtian Halloween sounds adequate and the tricks of the faiths soveriegn keepers are still up to no "good" in their little candy schemes. I can remember when Halloween was a remnant of Samhain and a celebration into the "night". Too bad though, in order for the kids to trick the "false" perhaps these "children" need guidance from a Priest of a different clothe? And btw., hello this would be my first post! Incipit Xaos! Stupid Xtians. Halloween is for candy! We should hand out TSB for Halloween then. Just a thought. They try to ruin everything. This sounds like a great occasion for a bonfire. I would love to see lots of little witches and devils tossing their mini bibles into the fire on Halloween/Samhain. Christians don't like life and especially traditions which aren’t based in their religion... (Of course with time they will invent something in Halloween… They did it with pagan winter solstice and invented Christmas). These brainwashed idiots love sufferings and they hate everybody who enjoys life and especially our dark brotherhood, they want to distinguish every dark flame. You said good - They hate even candies ! In their hate they have paranoia - they think Halloween is extremely occult and they don't understand commercialization of this event. Actually when I was young there wasn't even Halloween here. Traditionally we had Hallow's Eve, or as it was called here; All Saints' and All Souls', two separate days during which the dead were remembered. Halloween is an imported US cultural gimmick in my culture, as is Santa Claus on Christmas. 40 years ago, both were non-existent here but since it brings in cash, they are of course "embraced" these days. "JesusWeen". Wrong, wrong, wrong on so many levels, not just semantically. Christians already have two special days at this time of year: All Hallows Eve on October 31st and All Saints Day on November 1st. I suppose they feel threatened by Samhain reclaiming the former. Hallowe'en in the UK has certainly become commercialized of late. Kids wandering from house to house trick-or-treating for hard cash and making a nuisance of themselves being a major feature of this phenomenon. British pagans have celebrated Samhain for centuries, of course, with bonfires, booze and food (and sometimes ritual) and don't really buy in to the current shop-bought Hallowe'en. I'm planning on taking my boat out on her maiden voyage this year and must admit to purchasing some miniature electric lanterns in the shape of pumpkins and an inflatable black cat balloon. Should be classy. If I were a kid, I'd be pretty pissed off at whoever had the nerve to give me a book instead of the diabetes-inducing sweetness everyone expects. I don't see this as adding up to anything more than another disappointing attempt at bargain-bin evangelism. How about a Jesus'WeenieRoast? The image of pitchfork-pierced weenies roasting over an open fire is almost wholesome, and it plays on both the cannibalistic aspect of xtianity and x's supposed chastity. Afterwards, perhaps "Sacrilegious Mints" could be given out? I think i have to go during Halloween to UK or USA. Speaking of the Christian church and Halloween, I always look forward to a good laugh from Pat Robertson and The700Club around this time. The last one that particularly got me laughing was in 2009 when he proclaimed that witches prayed over Halloween candy in stores so that devils would inhabit them. One famous preacher spread in Latvia scary story about lady, who became obsessed by devil when she took Halloween candy and her mistake was following - she didn't pray before she ate the candy. Funny lesson for brainwashed religonists - You have to pray always and bless food even you eat the smallest candy. Christians are true idiots! Christians think, that we satanists are going to make a convert of somebody like they christianize the world. We have much better tool - we don't need 'evangelisation' - we accept human carnal nature and get the best of it... We have no need for proselytizing! There comes a point where the demoniacal superstition of hysterical Christians becomes far worse than that of any supposed "devil worshiper". In America there are spiritual warfare groups that spend their time trying to literally "pray the pagans away". They are a hilarious bunch, but it's a little bit uncomfortable to know that those are the sort of folk that would have us on the end of a rope, had they any real power. Was your friend's mother a little like this lady? That's pretty spot-on. 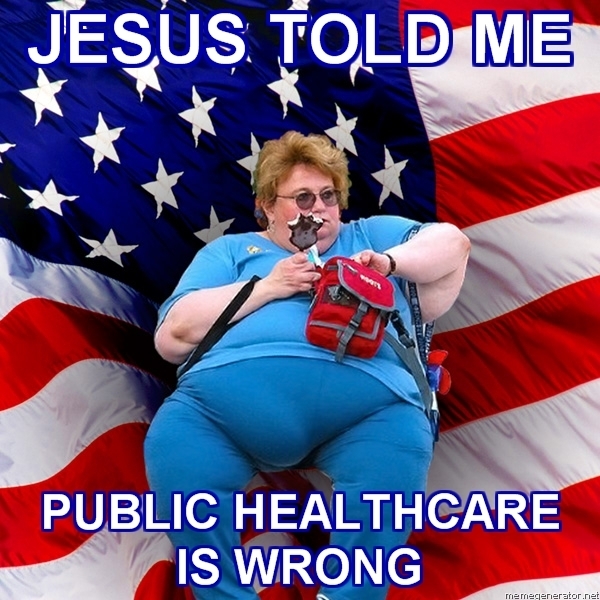 Eerie... how many addled, morbidly-obese American Christian women can there be? LOLOLOLOLOL! That's wonderful. I howled with laughter at this comment, too: "You'd think Jabba the Hut would have no problem with the Dark Side." Seriously, I watched the whole programme of the crazy lady and all the pagan family had done was offer her cake at a Solstice party. You'd think she'd have snapped it up! Thanks Felix 30 minutes to an hour later and I watched the flip side video. You're welcome, ta2zz; the "friends" actually scared me and not a lot does. Aaaaaaaaaaand - back to the original topic. Thank You, Zebu for great illustration! It means that I don't know real aggressive Christianity... Maybe some brainwashed individuals can be found in Latvia or in Baltic States, but mostly we are quite secular society and Estonia is the most secular country of the world. Of course because of mass culture and herd mentality some of this strange Christian radical teaching can be exported to old world and even to North-East Europe. I know some devil worshipers and they are friendly ones, they don't make evangelizations or they don’t behave aggressive in public and I like to talk and communicate sometimes with them... I prefer better to be in their comunity (much better) than in some Christian herd. They have similar views like Diane Vera, Venus Satanas … When they're asked, they answer about their beliefs and almost all of them are really worthy members of society. Brainwashed aggressive Christianity is truly dangerous movement. I'm happy, that Christian church haven't more so much impact in policy, in government's decisions etc..., than we will see renewed medieval mass hysteria again - real witch burnings again. Christian could spread again ideas of Malleus Maleficarum! Of course because of mass culture and herd mentality some of this strange Christian radical teaching can be exported to old world and even to North-East Europe. It is no coincidence that nearly every religious revival in the contemporary West is either fueled by or modeled after the American Evangelical movement. Even the Catholic Church has been taking cues from Baptist and born-again movements, eager to gain new converts and win back old believers. I see radical establishment-Christianity as being like a chained dog. At the moment it is leashed by secular materialism, and exploited by political corporatism for votes and money, but with times become more and more tense, who knows if this leash will snap or not? than we will see renewed medieval mass hysteria again - real witch burnings again. While such ideas still have theoretical currency in American and European scenes, Christians are regularly encouraging and enabling persecution of healers, traditional religionists, and the stigmatized throughout Africa and South America. I only wish it were as humane as burning or hanging, though. I followed second link and read the article and there is good example about danger of radical Christianity "Nwanaokwo Edet was one of an increasing number of children in Africa accused of witchcraft by pastors and then tortured or killed, often by family members. Pastors were involved in half of 200 cases of "witch children..."
It's great, that we live in free secular world. Radical Christianity, Islam and Judaism are very dangerous religions. Christians have been attempting to "get" Halloween for years. When I was a kid it was Hell Houses, papers given out instead of candy, and hayrides at the church. Has anybody dealt with the trunk or treats? Huge trend in the south. In the interest of "safety" rather than going door to door, you go to a church parking lot. People give out candy from their cars. The other thing that's done here is if the 31st falls on a Sunday, Halloween is rescheduled to the 30th. Pisses me off. Rescheduled to the 30th??? So how, exactly is that supposed to work with a Gregorian calendar? Hallowe'en is the eve of All Hallows Day or All Saints Day which is always celebrated November 1st. The former will inevitably fall on a Sunday every seven years or so. These people can't even respect their own calendar. Sounds like a good idea to me. I wish they would give me a Bible because I would gladly take it, open it up and start quoting things from it. Like the part somewhere in matthew that says how zombiejesus was supposed to rise up from his unknown grave some 2000 years ago before the last of his disciples died. Actually maybe they should give themselves bibles instead. They don't frickin read those things, they interpret them as they like. How utterly convenient. Yes, You're right! It is convenient for pastors, priests, evangelists and all who belong to any Christian movement, especially leaders. Soon we will see real Christian Halloween! Jesus said (we can read in NT) - he brings peace... (And even in the same from 4 gospels) he brings sword... Everywhere is contradictions and because of these idiocies Pastors can continue brainwashing and get gain of stupid herd. I like the 9th Satanic statement, especially the 2nd part of it: "Satan has been the best friend the Church has ever had, as He has kept it in business all these years!" For example, I like black metal, especially many Antichristian and radical Scandinavian groups... Christians know the relative popularity of such music and they invented unblack metal and one band 'Horde' has song “Invert the Inverted Cross!” Absolute absurdity! Christians know the relative popularity of such music and they invented unblack metal and one band 'Horde' has song “Invert the Inverted Cross!” Absolute absurdity! I actually get a kick out of Unblack Metal (even though it's a horrible name). Many artists in this genre used to get death threats from angry purists, and it takes serious balls to go up on stage before a bunch of rabid anti-religionists and play songs about Jesus. Many orthodox black metal-heads make such a big deal about how evil and inhuman they are, so it's hilarious to see them get butthurt over a couple guys making Christian metal. Felix the argument for moving Halloween is always hilarious. Sunday is the Lord's day. That always makes me chuckle due to The Ten Commandments. Isn't it in their own book that Saturday is "the Lord's day"? The level of illogic that Fundamentalists of any stripe carry is always a laugh. Yes, I know... Unblack metal Christian bands are accused 'in sorte Diaboli' and religionists say - they're obsessed by evil spirits... it just shows how intolerant is Christianity. Everybody after core principles Christianity, who is different or doesn't behave according dogmas/doctrines, is 'from evil!'. Quote from the JesusWeen website: "JesusWeen is a non profit organization also known as JesusWin." Jesus win? Are they serious? That must be one of the cheapest puns I've come across in a long while. Thanks for link 'The Latest Christian Halloween Protest: Jesusween' from time.com. Generated in 0.05 seconds of which 0.004 seconds were spent on 43 queries. Zlib compression disabled.